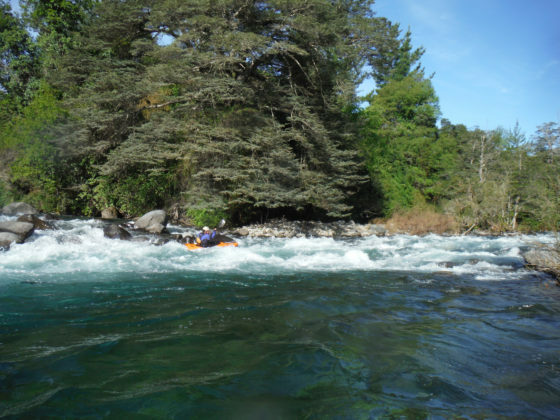 This Winter/Spring run flows of the peaks of Cordon Infiernillo (1972 meters) , Blanquillo (1780 meters) and Cordon Cholguan (2148 meters) and forms the border between Provincia Bio Bio and Ñuble both of which are in Chile´s 8th Region. Cholguan derives from a Mapuche word meaning clam. The river is freeflowing and in early season is snowmelt and later rain fed. A hydroelectric diversion project called Proyecto El Pinar is being built just upstream of the put-in and it remains unclear how or if this will affect future boating. Directions: From Ruta 5 in Los Angeles take road towards Antuco (Rio Laja) for 30 km. Go north for 43 km to town of Yungay. Zerp out your odometer and head east on paved road (Calle Angamos) for 12.5 km. Here the road turns to gravel. At km 21.3 turn right towards Santa Lucia. Follow road down to valley floor. We choose a takeout about 1 km up the river and had a nice riverside camp about 2.2 km above our takeout. 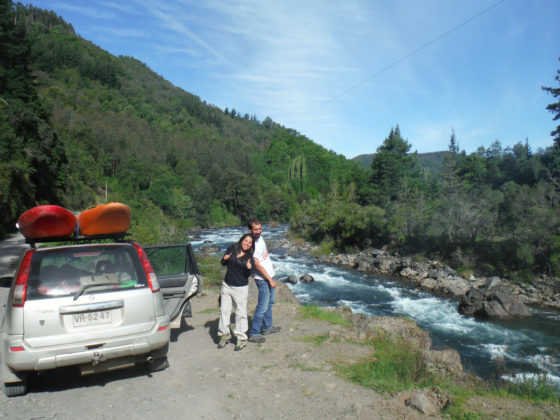 Continue up river to a small bridge over the tributary Río Congrejo. We put on at this point on a small 100 CFS tributary and flowed it down to a branch of the Cholguan where the flow increased to 350 CFS. After another 1-2 km other branches of river converged bringing flow up to 700 CFS for remainder of trip. ions: From Ruta 5 in Los Angeles take road towards Antuco (Rio Laja) for 30 km. Go north for 43 km to town of Yungay. Zerp out your odometer and head east on paved road (Calle Angamos) for 12.5 km. Here the road turns to gravel. At km 21.3 turn right towards Santa Lucia. Follow road down to valley floor. We choose a takeout about 1 km up the river and had a nice riverside camp about 2.2 km above our takeout. Continue up river to a small bridge over the tributary Río Congrejo. We put on at this point on a small 100 CFS tributary and flowed it down to a branch of the Cholguan where the flow increased to 350 CFS. After another 1-2 km other branches of river converged bringing flow up to 700 CFS for remainder of trip. The run is continuous class 3 with nice wave trains. We took out 13.4 KM downstream about two km up from where the road descends of the high ridge.